Byron are going to attempt nose-to-tail eating with an entire cow at the Camden Town Brewery (nr Kentish Town West station) at the end of this month, with a special 2 day session involving burgers, chilli, ribs, and of course lots of Camden Town's beers. Don't miss it! 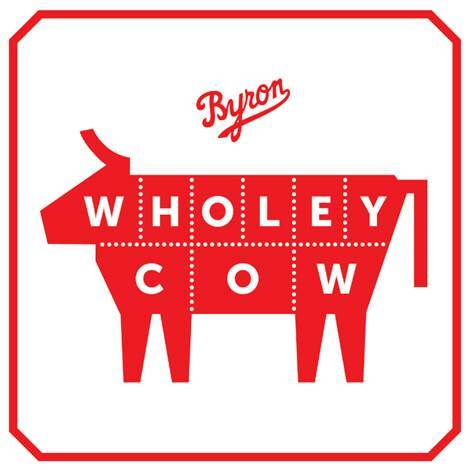 "One whole cow, two summer nights, and a lot of hamburgers: on 30th and 31st August, Wholey Cow will see Byron turn an entire cow into food, with Camden Town Brewery playing hosts and providing refreshments. Wholey Cow will be a summer cook-out on an epic scale, with a menu designed to make the best of the entire beast - three different burgers, chilli cheese fries, sides of mac ‘n’ cheese hash browns and Bloody Bulls. The Wholey Cow story will begin this month, as the Byron team travel up to one of the Scottish farms that provide their beef. On the farm, they’ll pick the best cow for the job, then follow the process from slaughter, to aging, to butchering. Back in London, every possible part of the animal will be put to use. The rich, tender forequarter will be ground into hamburger patties with the perfect combination of fat and flavour. Tougher but tasty cuts – shins, cheeks, tail – will be slowly braised into the ultimate, unctuous and melting chilli. Finally, the short ribs will be cured, slow-cooked and sliced to create a unique topping somewhere between bacon and pastrami. To wash it all down, in addition to Camden Town’s craft beers and Byron Pale Ale and Lager, Byron will be serving Bloody Bull cocktails, a super charged Bloody Mary with beef bouillon substituted for half the tomato juice."